Hello Gorgeous: Things I'm Watching on eBay. Remember this gorgeous Pieces chandelier? It sold for $1750. 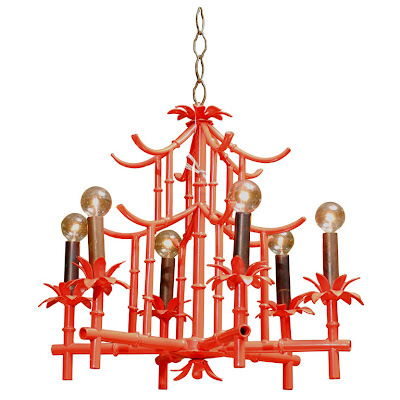 This pagoda chandelier on eBay is a very close second. Add a new coat of paint, new or painted candle sleeves and round bulbs. The current bid is $202.50. I would totally be bidding on it but I don't really have a need for it. So, somebody please buy it, doll it up and send me a photo. I was also watching this Hermes small porcelain Chaine d'ancre trinket/change tray but missed the final bidding last night while I was making dinner. The winning bid was $103.49 - more than I was willing to pay but much better than its original price tag of GBP 400-something. At least I thought so until I found this website, Park Avenue Gifts, wherein you can buy an entire 5-pc. place setting of the pattern for $336. Or a cup and saucer for $89. And when you're not drinking from it, you can just leave it lying around to class up the joint. There's a smaller, nautically themed Hermes tray currently up for bidding on eBay and the current bid is only $24.99. It ends today with no reserve. A nice little knickknack for the beach house, don'tcha think? Here are a few things I was watching and decided against bidding on. My bidding strategy is to wait until the last minute of bidding and put in my maximum bid. It's take-no-prisoners on eBay. The first two sold for more than I was willing to pay anyway but I think the person who listed this last item was being greedy. The bidding was up over $800 and it still hadn't met the reserve. And even though this is vintage (which can sometimes mean "smells like my grandma's cats") you can get it new for $1050 from the Gilded Mirror. I do think eBay has really been stepping up its game lately. How about you? Have you seen anything great on eBay lately? Ok, am I the only dolt who's never checked out ebay. Guess so. Checking it out could lead to bad things after seeing your fab finds. thanks for sharing. I've seen a lot of good stuff on the 'bay lately, but haven't bid on much. 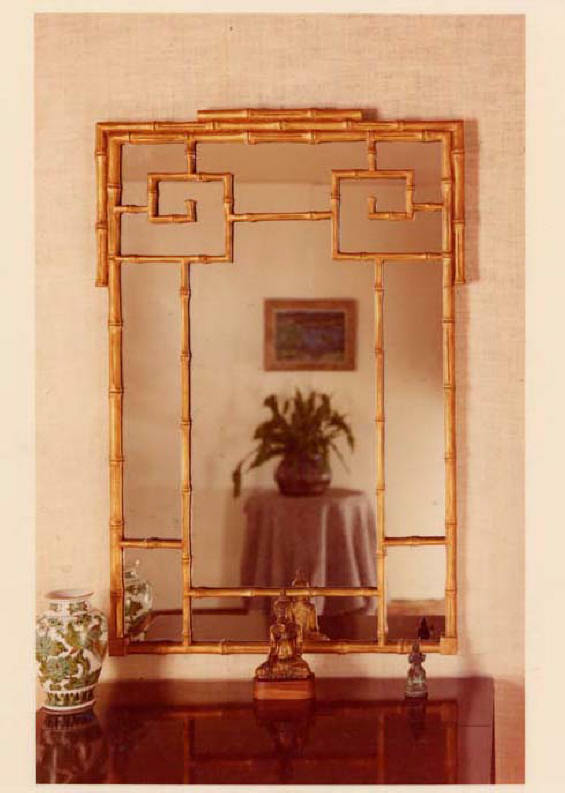 I sold a mirror with a gold bamboo lattice frame not so different from that last one for 202, so keep watching, a good deal will pop up. Erica: Well, in fairness I should also do a post entitled, "The many times I've been burned by eBay." Im fighting w/ ebay at the moment. I used to love selling stuff but now they say that I havent sold enough designer stuff to sell designer stuff!! figure that one out haha. i want all of it. that chandelier is remarkably similar. lots of luck. hope you win + then you must post pics! i need an ebay whisperer in my life. clueless on how to buy or sell. great finds! I haven't been on ebay for a while but will definitely visit soon-sometimes I get too involved and bam it 3am--have to ration my ebay time! Wow! You have really found the best stuff, have been on Ebay for awhile...don't know why cause some of my favorite possessions in the world came from there! Time to return (after we head home)! I love the faux bamboo look. It is always fresh and evokes gardens and conservatories. Unfortunately, I could not do without eBay. I find wonderful things, and I commend the sellers who work hard to find, list, pack, and mail in spite of the privileges and feedback that have been taken away from them. i love all the items you posted. i was just on ebay this morning and found a sweeeet bamboo coffee table, and the bid was at 9.99. sure, i would have to pay $65 to ship it, but still...it was so cute! LOVE those chairs. I have a fantasy of opening a shop selling chairs, and benches and I will call it, Have A SEAT. Those chairs are pretty great. My sister laughs at me for being the queen of saved searches on eBay. I've been lucky so far, only one scammer - and I got my money back there. Use to be an ebay warrior. I think I've logged just shy of 800 purchases and sales. Over the course of this year though I've banned myself, it's brutishly painful. I've found some great things over the years though and you really did too. So fun to see your discoveries. P.S.- thanks for your great comment yesterday. So fun to have a connection through marching band. Over the course of dad's teaching career he had several groups (marching, concert & jazz) perform in 9 countries. First US band to play on the Great Wall of China. Such a part of my life growing up. Good times! I should also do a post entitled, "The many times I've been burned by eBay." I have bought many of the same things, pictured in this post. I bought my sunburst mirror on Ebay,and had it made into a plaster ceiling medallion.